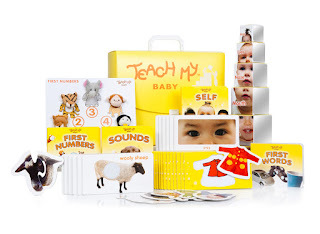 We had the wonderful opportunity to facilitate a review for the TEACH MY Baby kit. I had heard other mothers say wonderful things about this inclusive all in one learning kit, and I was really happy that me and my granddaughter would have the chance to work with one. I really feel like a lot of other parents do, learning starts in the home and there is no better teacher than a parent. The TEACH MY BABY FIRST WORDS section includes a board book and 12 one piece puzzles. The board book has 12 pages of pictures with words underneath each picture. This section will help introduce your baby to their first 12 common words. These first words were chosen based on lists prepared by speech pathologists. Simply repeating words to your baby encourages normal speech development. Read the book slowly and read it repeatedly to your baby, and talk about the pictures. The TEACH MY BABY SELF section is targeted towards the babies face parts. It comes with a board book, mirrored nesting blocks and mirrored flash cards. Brandi Lynn, who will be 10 months in a couple of days loves to look at herself in the mirrors. In just the couple weeks we have been working with the kit I can tell it's already made a difference. When we look at the different parts of the babies mouth and tongue, then in the mirrors, Brandi Lynn has started to pucker her lips towards her nose, it's adorable. Through her facial expressions I can tell she is learning. The TEACH MY BABY FIRST NUMBERS comes with a first numbers board book and a story board with 5 puppets. Brandi Lynn loves the puppets, she giggles and laughs every times we play with them. 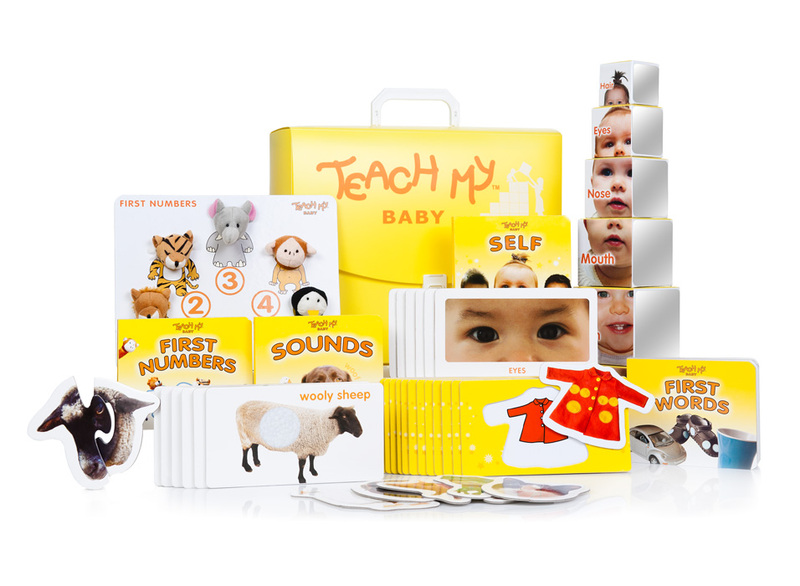 The TEACH MY BABY SOUND AND TOUCH includes a board book, 2 piece puzzles and some flashcards that have different animals on them. Each flashcard also has a different texture she can feel. I think she likes the different feels of the textures. The kit also includes a teaching guide which contains 10 steps to success and how to use each part of the kit. It recommends spending at least 20 minutes a day using the TEACH MY BABY kit with your child. I was amazed at how much they packed into this plastic storage case. My thoughts are this so worth it! Give your baby a head start. I use this with Brandi Lynn everyday, I have seen changes in just a couple of weeks, using the kit 20 minutes once or twice a day. This will benefit your baby in so many ways, including helping with their fine motor skills and getting an early start on basic educational building blocks. These great all inclusive sets can save you a ton of money, instead of buying individual teaching tools, this set provides everything necessary for learning the basics, all in one steerable and portable case. TEACH MY was founded by Christy Cook who discovered early on in her parenting career that parents are their children's best teachers. This inspired her to create a series of easy to use products for parts to teach their children the beginning learning tools such as the alphabet, counting, reading, telling time, colors, animals, and more. TEACH MY Company has been featured on The View, The Dragon's Den and Women Owned. The TEACH MY BABY kit has currently won 4 awards including the Parenting Media Award. The kits are available in baby, toddler and preschool sets. Their currently available nationwide for $39.99. This is an amazing price considering how much you get inside the plastic carry case. TEACH MY also sells the packages separately in case your just looking to work on one area with your child. Make sure you visit their website teachmy.com to see if there are any kits that might be good for you and your child. Maybe their is a kit you could put on your Christmas list for some special child. At this affordable price makes these kits worth it, change the life of a child near you and give them a head start! You can connect with Teach My via Facebook , @teachmy , You Tube , Pinterest , Instagram and Teach My Website . I think my son and his wife would really be interested in this, they are expecting their first baby in June. Wow, it really seems like you get your money's worth with this! Not only is this a great way to teach your baby but also a great way to spend time together. This is such a great looking kit! I'm currently expecting my second lil one this coming spring, and this will be wonderful. I wish I had it when my son was younger! We have a couple of the Teach My sets. One of my daughters is becoming a day care director, and she has been accumulating things that she wants to use at her future center. These where at the top of her wish list. She loves them. I have heard great reviews about this!! I have yet to try it myself but i'm sure i would love it.